The ratio between ATP and AMP is used as a way for a cell to sense how much energy is available and control the metabolic pathways that produce and consume ATP. The body attempts to maintain a specific ratio of AMP:ATP; when this ratio is out of balance, the cells adjust their metabolism accordingly. As the ratio increases either by increased levels of AMP or decreased levels of ATP, the body is signaled to produced more ATP. The AMP:ATP ratio is primarily regulated by an enzyme known as AMP-activated protein kinase (AMPK). 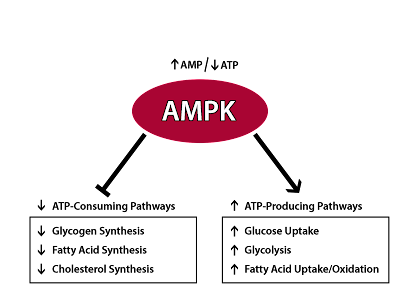 When activated, AMPK sets in motion a series of events which switch cells from active ATP consumption to ATP production. The presence of AMP leads to an increase in AMPK activity by approximately 5-fold, however AMP also plays an important role in regulating the level of phosphorylation of AMPK. “An increased AMP to ATP ratio leads to […] increased phosphorylation and decreased dephosphorylation of AMPK. The phosphorylation of AMPK results in activation by at least 100-fold.” This means that a relatively small increase in AMP can result in a dramatic increase of AMPK activity. Adenosine monophosphate (AMP) is a naturally occurring cellular metabolite and is one of the four purine nucleotides responsible for protein synthesis. It is also a key component in certain enzyme reactions necessary for proper fat and carbohydrate metabolism. AMP appears to be beneficial for correcting low energy production due to mitochondrial dysfunction by increasing AMPK activity, a crucial regulator of cellular metabolism. AMPK activation has been shown to help reduce fat storage and triglyceride production while increasing fat burning and glucose uptake. When AMPK activity is impaired, glucose and fat begin to accumulate, leading to conditions such as increased belly fat, elevated blood sugar, insulin resistance, and high cholesterol.